IBM continued to tweak its System x lineup Tuesday when it announced more machines supporting the latest Intel Xeons, and allowed Nvidia Tesla GPU coprocessors into the systems. Big Blue also bent some metal in its iDataPlex rackish blade servers - or bladish rack servers, depending on how you want to look at . The moves make sense. With its System x x64-based server lineup being the only one showing growth among its three portfolios at the moment, IBM cannot afford to let Hewlett-Packard or Dell get the jump on it with a massive upgrade cycle expected for x64 machines this year. First up in IBM's push is the System x3620 M3, what Big Blue calls a "cost-optimized" rack server, sporting two of Intel's "Westmere-EP" Xeon 5600 processors, which come in flavors with four and six cores. Part of that cost-optimization is the x3620 M3's 675 watt power supplies with 92 per cent efficiency, which will save data centers some dough over the long haul in power and cooling. The system has a dozen DDR3 memory slots, with 1GB, 2GB, 4GB, and 8GB memory sticks supported, for a maximum capacity of 96GB. The System x3620 M3's motherboard has an internal 2GB USB flash drive for supporting embedded server virtualization hypervisors, but at this point, only VMware's ESXi 4.0 hypervisor is certified using this internal drive - although there is an embedded version of the XenServer hypervisor from Citrix, and it probably won't be too long before there is an embedded version of KVM from Red Hat, too. The x3620 M3 comes in a 2U rack-mounted chassis that has eight 3.5-inch disk bays in the front, which can have SAS or SATA drives slid in. The system has two Gigabit Ethernet ports, two PCI Express 2.0 slots (one full-height x8 and one low-profile x4), and an integrated service processor that supports IPMI 2.0 systems management protocols. In a base configuration, the System x3620 comes with 2GB of memory and a single four-core Xeon E5506 processor spinning at 2.13GHz; it costs $1,849. A fatter configuration with a six-core 2.66GHz Xeon X5650 and 12GB of memory runs $4,609. But beefing this puppy up costs some cash: adding a second processor, putting in four 600GB 15K RPM SAS disks, and pumping up memory to 36GB pushes the price up to $13,120 - and that's without an operating system or hardware tech support. 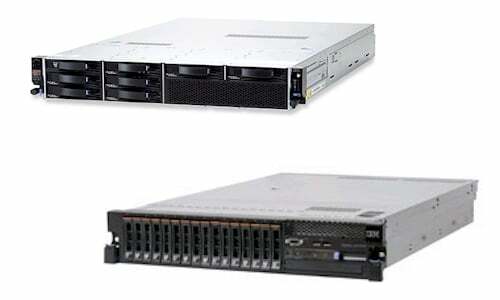 The IBM System x3620 M3 (top left) and x3650 M3 (bottom right) rack servers. The System x3650 M3, which was announced as part of the Xeon 5600 server rollout in March, has been tweaked this week, too. The x3650 M3 is a 2U rack server with two processor sockets certified to run Intel's Xeon 5600 processors in either the four-core or six-core variants, as we said it would be back in March. This being the week of SAP's annual Sapphire user group meeting, IBM is rolling out a variant of the x3650 M3 that is preloaded with SAP's Discovery System V4 software, which is a tool that SAP uses to allow customers to test-drive its ERP and BI software suites. The System 3650 M3 doesn't seem to have been changed in any other significant way, and will be available on June 10. The x3650 M3 has 18 memory slots and supports up to 144GB of main memory across its two Xeon 5600 sockets. It has room for 16 2.5-inch drives (SAS or SATA), and four PCI Express 2.0 x8 slots. The machine features the same 675 watt, 92 per cent efficiency power supplies used in the x3620 M3, and sports two Gigabit Ethernet ports. In a base configuration with a four-core 2.26GHz Xeon E5507 processor and 6GB of main memory, the x3620 M3 costs $2,285. Moving up to a six-core X5680 running at 3.33GHz and boosting memory to 12GB raises the price of the base machine to $5,569. Doubling up the CPUs on this machine, adding four 146GB, 15K RPM SAS drives, and pushing memory to 36GB cranks the price up to $15,519.